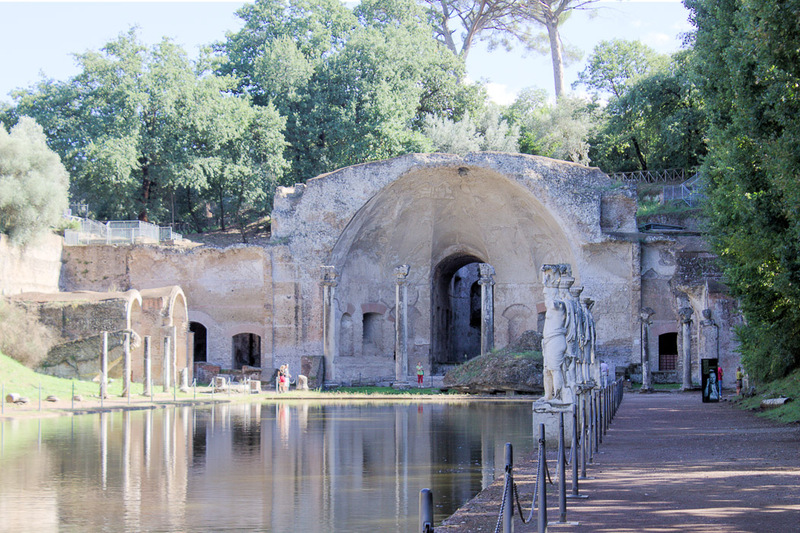 Hadrian's Villa was constructed by Emperor Hadrian as an out-of-town retreat during the second and third decades of the 2nd century AD. 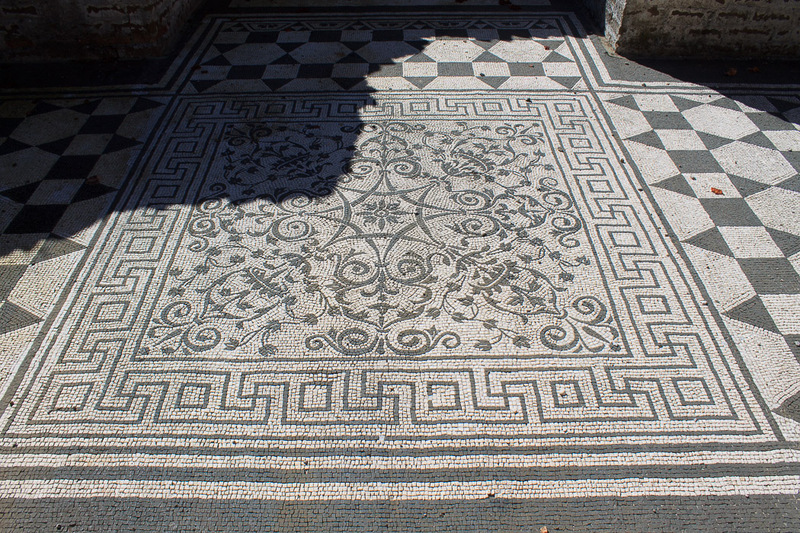 He disliked the imperial palace on the Palatine Hill, so reigned the latter part of his years from this villa. The villa was used by some of his successors, but fell into disuse and ruin. The villa was a complex of over 30 buildings, covering an area of about 1 square kilometer, much of which is is still unexcavated. 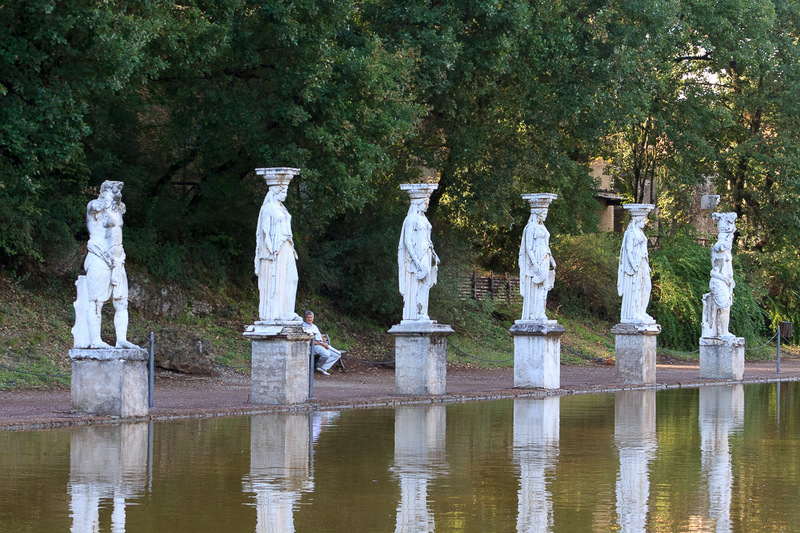 Expect a lot of walking when you visit Hadrian's Villa. 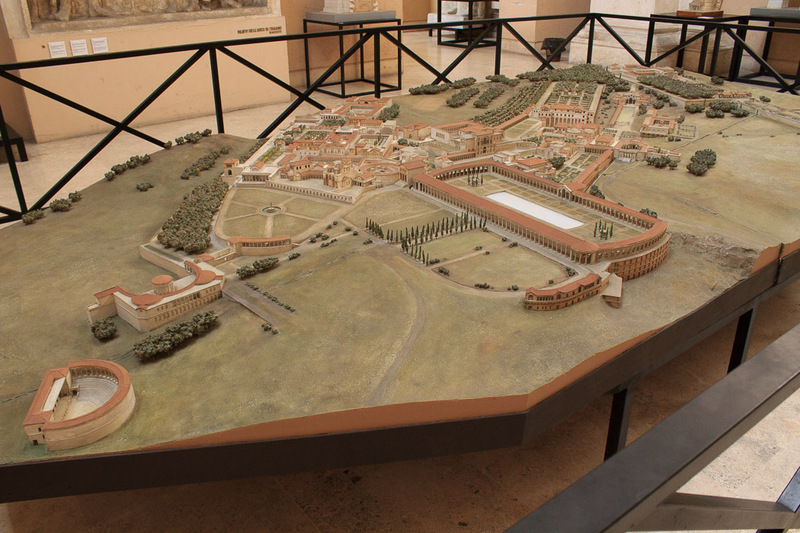 The model of Hadrian's Villa in the Museum of Roman Civilization is shown in the photo below. To get there from Rome using public transportation, take Metro Line B (blue) to Ponte Mammolo, then walk downstairs into the bus station to buy a ticket (and your return ticket) on the local blue Corval bus to Tivoli. It should cost €2.20 each way, and 3 buses run per hour for the 45 minute bus ride. 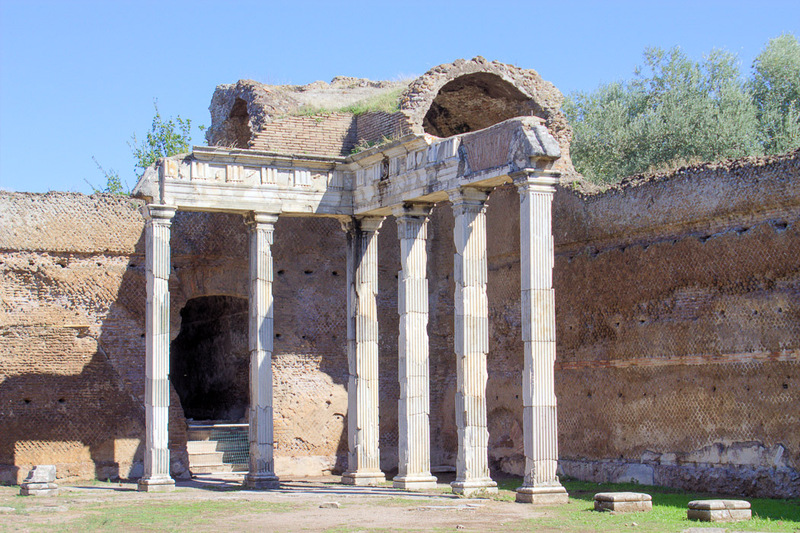 Get off the bus soon after pasing the quarries and walk about 20 minutes through a residential area to Villa Adriana (Hadrian's Villa). 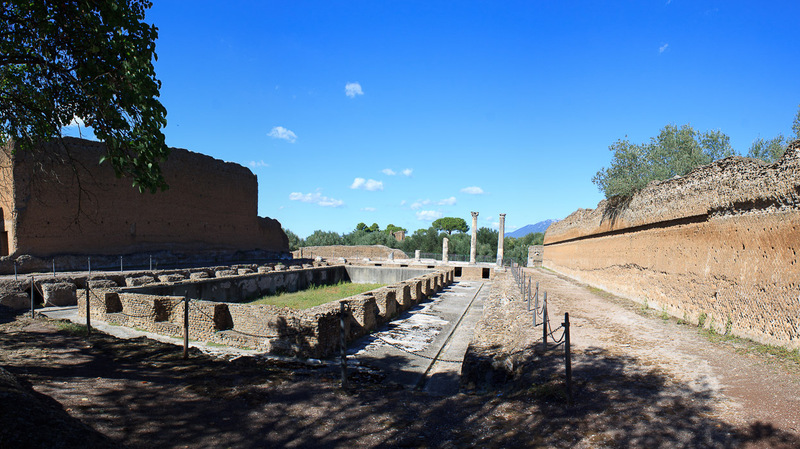 Ask the bus driver or fellow passengers where to get off the bus, and ask locals for walking directions to Villa Adriana. 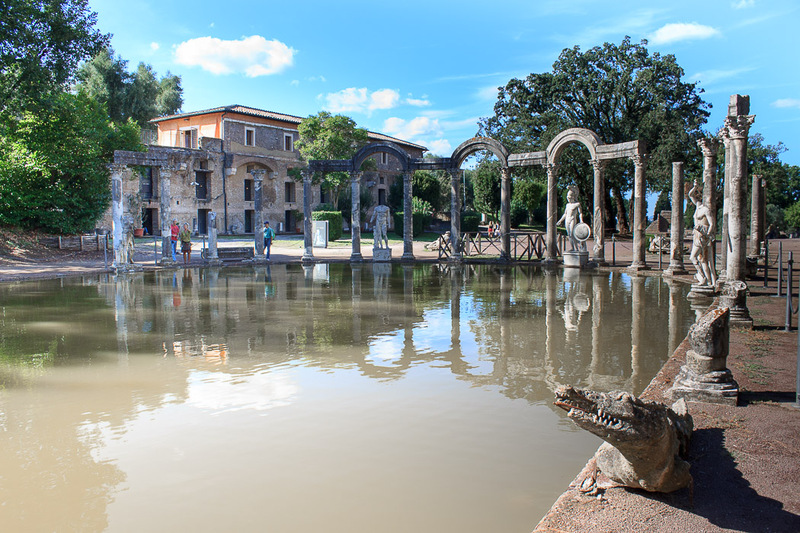 Or, if you're also planning to see Villa d'Este, I'd suggest seeing Villa d'Este first, since the yellow bus between Villa d'Este and Hadrian's Villa takes you much closer to Hadrian's Villa. 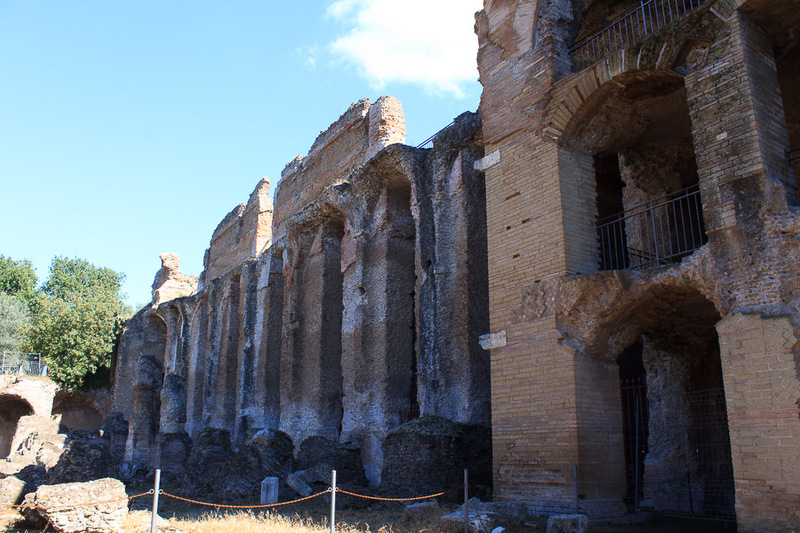 See all Hadrian's Villa photos. 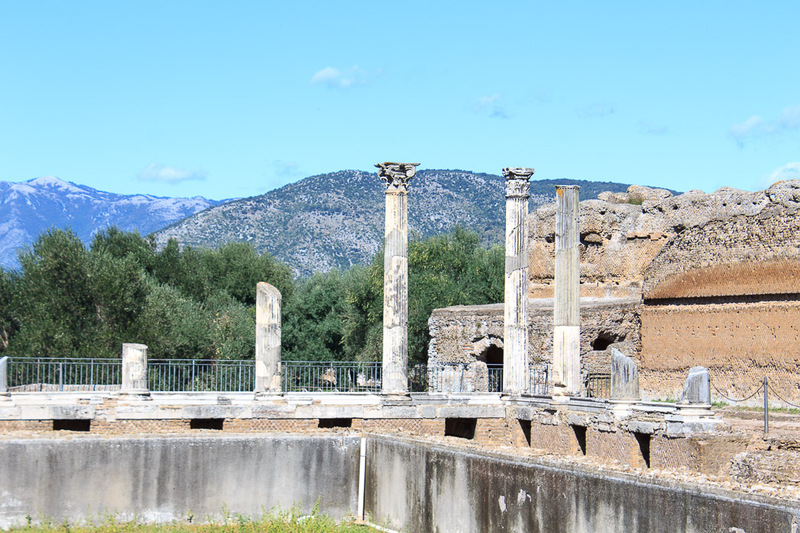 The Baths with Heliocaminus (1st photo below), near the start of your tour, are so-named because the great dome which is still partially standing once covered an intensely heated room. 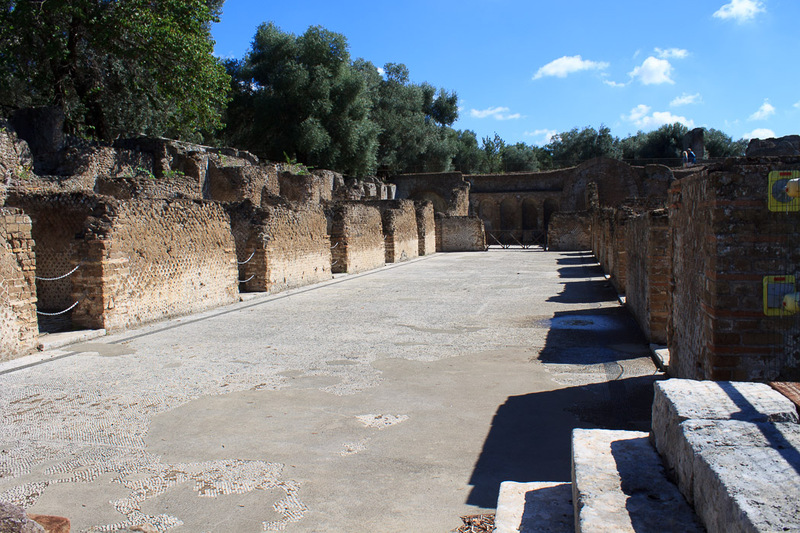 The Hall of Philosophers (2nd photo below), is just beyond the Baths and was probably the monumental audience hall for the Emperor. 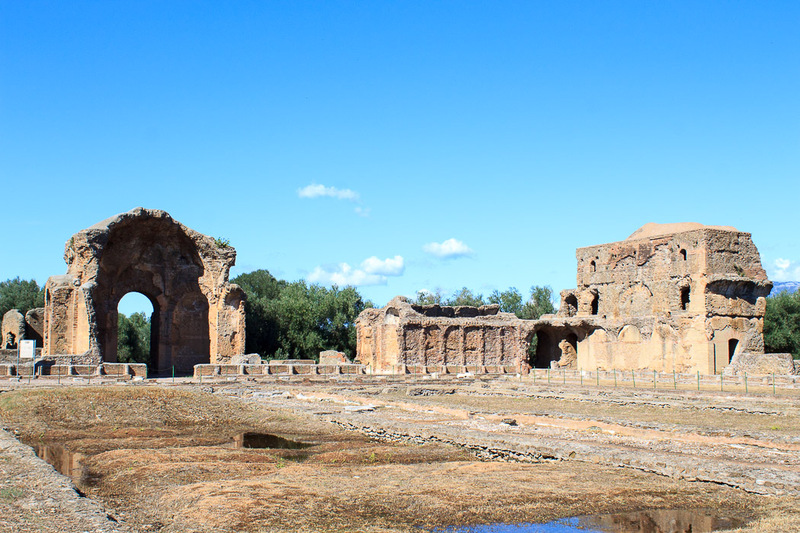 The Maritime Theater (both photos below) is among the more famous structures at Hadrian's Villa. The Maritime Theater was the same shape and size as the Pantheon in Rome, with a columned porch in front and a round area inside. Inside was a round water basin surrounded by columns, with an island in the center which housed a miniature villa with all its comforts. Two removable bridges allowed access to the island, and once removed provided a private and safe place for the Emperor to rest. 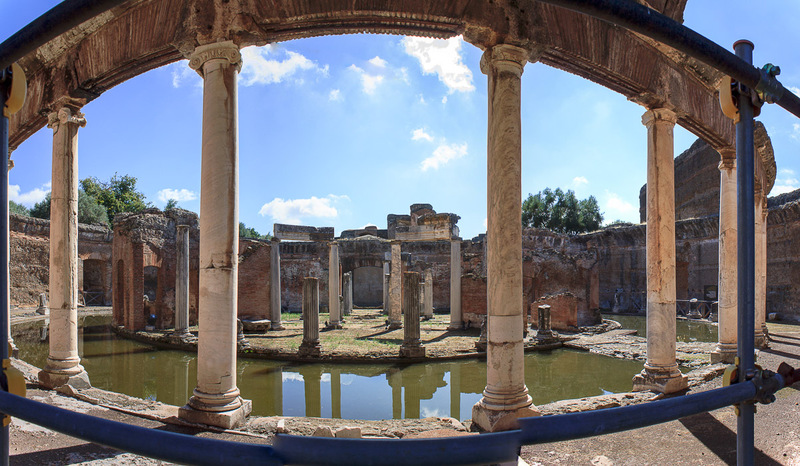 The Imperial Triclinium was attached to the Hospitalia, and had the courtyard shown in the 1st photo below. The imperial palace included the possible throne room with Doric pillars shown in the 2nd photo below. The Piazza d'Oro, or Golden Square, was a large building with a great rectangular open courtyard which had flower beds and water basins, surrounded by a double-porch. The Piazza d'Oro might have held the great Library of the Villa. 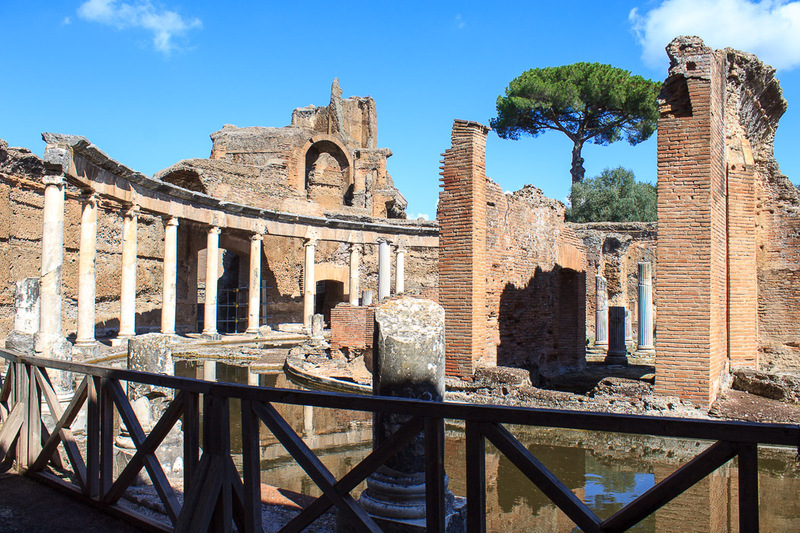 The Peschiera (1st photo below) was part of the Winter Palace at Hadrian's Villa, which was a building which was heated during the winter and housed a swimming pool (2nd photo below). 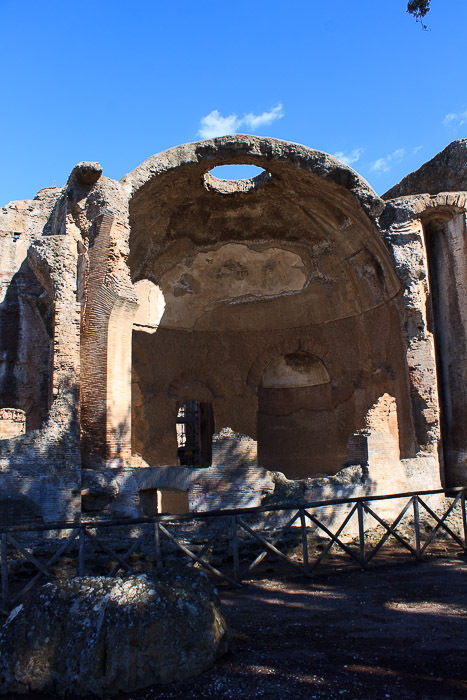 The niches in the 1st photo below probably held stautes which were stolen in late antiquity. The Great Baths (1st photo below) were used by people of low social rank, like servants and slaves. The 2nd and 3rd photos below, also of the Great Baths, were taken from the other side of the baths as the 1st photo below. The Small Baths were much more highly decorated and reserved for the Emperor and people of high social rank. 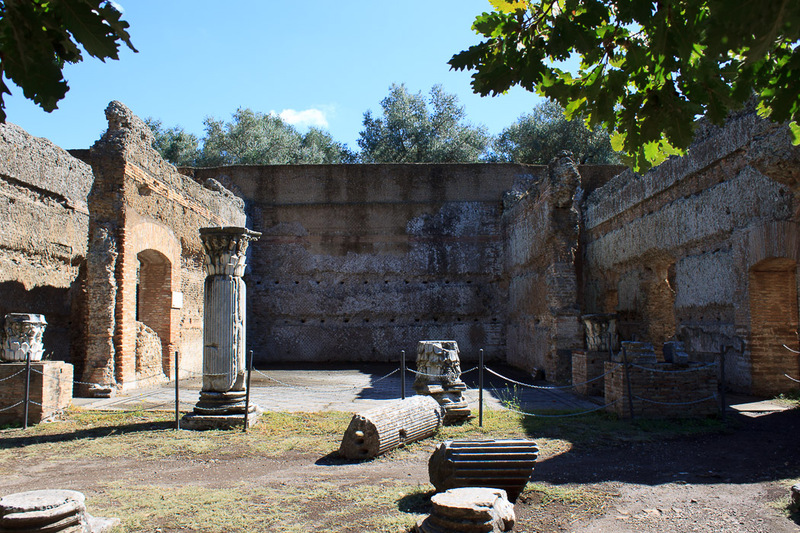 The Praetorium Pavillion (4th photo below) was used for storage and perhaps as dormitory rooms for the service staff. 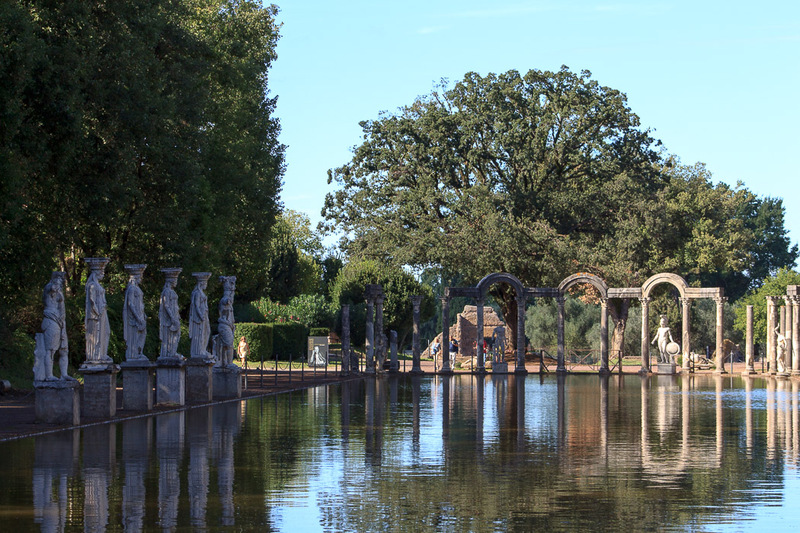 The most famous and photographed building of Hadrian's Villa is probably the Canopus, a long narrow outdoor pool surrounded on three sides by Corinthian columns with archways above them, with statues between the columns. 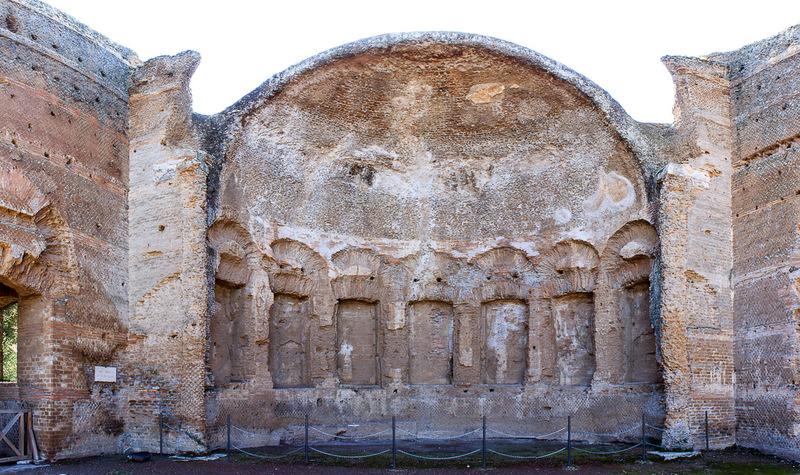 The fourth side, one of the narrow sides, is a monumental grotto shaped like a seashell, decorated with niches, fountains and waterworks. The Canopus was a replica of the sanctuary in Alexandria of the Egyptian god Serapis. 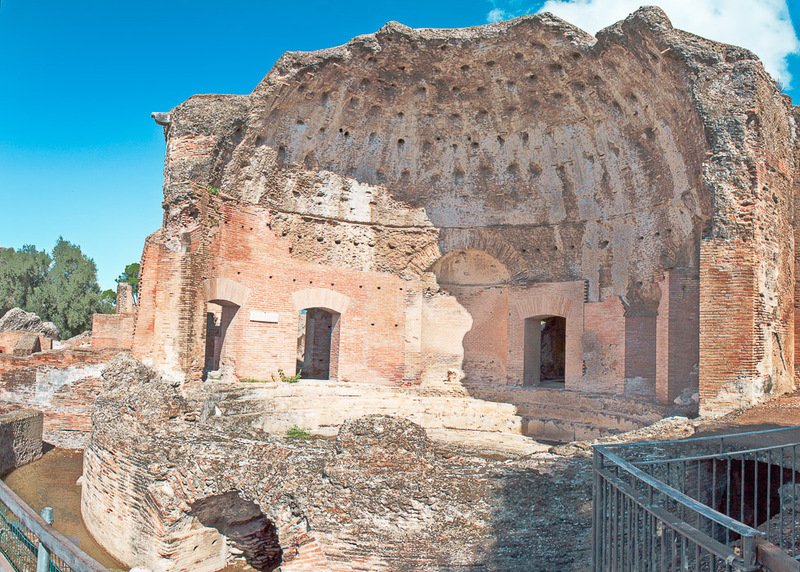 During the summer the Canopus was an open-air dining room. Few of the Corinthian columns still stand; most of them are on the opposite end of the pool from the grotto. That segment of columns is shown in the 1st photo below, and the grotto is shown in the 2nd photo below. More photos of the Canopus are shown in the subsequent photos. 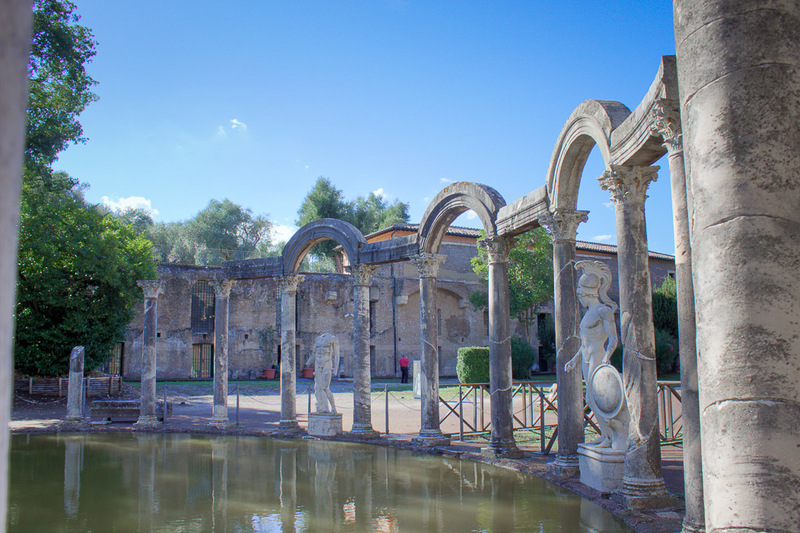 To go back to Rome, buy a bus ticket for bus #4 or #4X where you bought your entrance ticket for Hadrian's Villa, and catch the bus right in front of the site to the center of Tivoli. Get off at the main road, Via Tiburtina, and get on a Cortal bus that's headed to Rome (per Roma). That bus should take you to Ponte Mammolo, where you can take the metro back to your hotel. 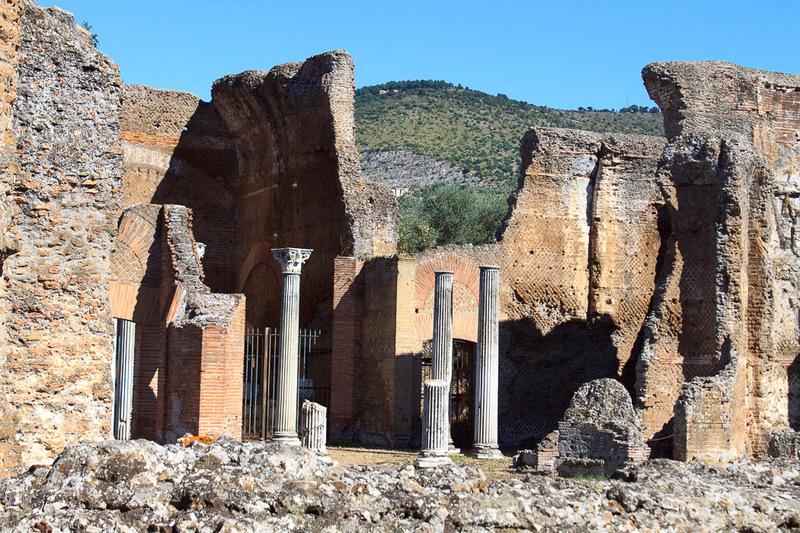 Villa-Adriana.net has maps, great descriptions of the various buildings, history, etc.